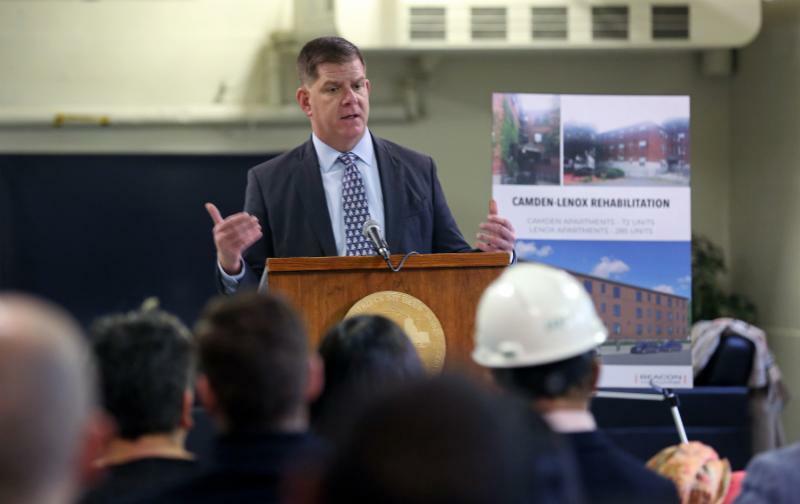 BOSTON - Tuesday, January 29, 2019 - Mayor Martin J. Walsh and Boston Housing Authority (BHA) Administrator Bill McGonagle today kicked off a $23 million redevelopment of 367 affordable housing units at the Lenox/Camden Housing Development. In Phase One, BHA's developer Beacon Communities, will improve and preserve 72 units of affordable public housing on Camden Street in Roxbury. Phase Two will include the renovation of the adjacent Lenox site, which is slated to begin next year. "This renovation marks an important new chapter for this historic development, and I am proud to begin our work together today to make his neighborhood stronger than ever," said Mayor Walsh. "This redevelopment will not only modernize these buildings to make them more energy efficient, safe and accessible, but will help us continue to set a national standard for quality public housing." The Camden development will undergo substantial renovations to all 72 of its apartment units, including new kitchens, bathrooms, paint, flooring, and windows. The project will modernize the building, bring energy-efficiency improvements, improve accessibility throughout the site, and create four fully handicap accessible units, as well as landscaping improvements. The Camden project is expected to create more than 60full-time jobs by the time of the project's completion in June 2020. "One of our top priorities at the BHA is to improve the quality of life of our residents and ensure that they can count on their affordable housing as long as they need it," said BHA Administrator Bill McGonagle. "This project will give our residents an upgraded site that is accessible, environmentally friendly, and vibrant, and it will protect the site's affordability for decades to come." "Beacon is proud of our long partnership with the Boston Housing Authority and grateful to the many city and state and federal agencies and other partners who made this transaction possible," said Beacon Communities CEO Dara Kovel. "The rehabilitation will allow for Camden Apartments to serve as a quality affordable housing resource for many years to come." Camden was one of the first city projects authorized under the Commonwealth Veterans Assistance program, allocated to support returning veterans after World War II, and the only housing development of its kind built in Lower Roxbury. Camden's history helped the site secure federal and state historic tax credits through the Massachusetts Historical Commission and the National Park Service. The planned renovations represent an investment of more than $23 million that will preserve Camden's long-term affordability through new operating subsidies and the Low Income Housing Tax Credit (LIHTC) program. The state public housing subsidy will be replaced by 48 federal Project-Based Vouchers for low-income residents, and 24 subsidized vouchers that will be funded through the Massachusetts Rental Voucher Program. Funding partners for the project include MassHousing, the Department of Housing and Community Development, BlueHub and Federal Home Loan Bank of Boston. RBC Capital Markets is providing equity associated with the project's tax credits. "We are proud to support the revitalization of the Lenox/Camden Housing Development with more than $15 million in direct funding and federal tax credit equity to preserve this important resource for Boston residents," said Housing and Community Development Undersecretary Janelle Chan. "Our partnership with the Boston Housing Authority and Beacon Communities will improve the quality of life for residents and ensure the building will remain affordable for future generations of families." The Camden/Lenox renovation strongly aligns with the City's housing goals outlined in Housing a Changing City: Boston 2030. Mayor Walsh recently increased the City's overall housing targets from 53,000 to 69,000 new units by 2030 to meet Boston's population growth. These updated housing goals build on Mayor Walsh's commitment to increasing access to home ownership, preventing displacement and promoting fair and equitable housing access.